French anti-Semitism must share the blame for the murders in Toulouse. The Toulouse school shootings were horrible. But they should come as no surprise. 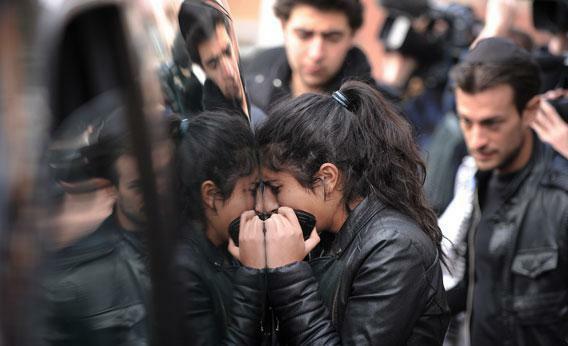 A woman mourns after the funerals of three French-Israeli children and a Jewish teacher killed in the March 19 school shooting in Toulouse, France. Photo by Phillippe Desmazes/AFP/Getty Images. I’m an American Jew who lived in France for most of the last four years, first in Nantes and later in Paris. Last year, I was sitting in a café in the 6th arrondissement with two French college friends, randomly recounting to one of them—a nonpracticing Jew whose family has long lived in Paris—a philosophical debate from a Jewish studies course about married women covering their hair. The other friend, not Jewish but also raised in Paris, cringed as he listened to our conversation. Taken aback, my Jewish friend and I both looked at each other, me hoping he would break the silence. I was the foreigner, after all—wasn’t it his place to defend himself in his native city? But nothing came of it. Seconds later, the awkward moment passed and my two friends went about chatting as if nothing had happened. But that experience—between supposed friends, no less—confirmed a suspicion I’d come to harbor about how many French view their Jewish countrymen: with furtive skepticism and distaste. To understand exactly what happened in that café, you must first grasp a simple truth: You cannot actually be both French and Jewish. For an American, that sounds odd. After all, in the land of plenty, Jews can identify with endless variations of hyphenation: Jewish-American, American Jew, “half-Jewish,” even “quarter-Jewish.” It would rarely, if ever, occur to you that someone would question whether you could be both American and a member of that Israelite faith. You are considered as Jewish as you are American, as American as you are Jewish. But what seems so simple in the United States is anything but in France. In the end, the trouble stems from the idea that “French” means you follow the values of the state—in this case, secularism. What Americans often believe to be the mere French version of “separation of church and state” is actually diametrically opposed to Americanized freedom of religion. In short, while Americans value freedom of religion, the French value freedom from religion. In practice, French secularism, or laïcité, means that you don’t express your religious beliefs in public: That means in public schools, Muslim girls can’t wear their veils, Jewish boys can’t wear their kippot, and Christians can’t draw attention to their crosses. It also means that when a state exam falls on your religious holiday, well, tant pis, because laïcité means you’re supposed to be French before anything else. Secularism regularly pops up in political debates. Indeed, it has been one of the driving points in this year’s presidential election. Just this month, Prime Minister François Fillon suggested that Jews and Muslims give up their “ancestral traditions” of eating kosher and halal meat, highlighting the French belief that one can’t be both a religious person and dedicated citizen. Interestingly, no one knows with certainty how many people in France practice different faiths: The République doesn’t keep official stats. It is only by approximation that we estimate that largely atheist France is also home to the largest Jewish and Muslim populations of Europe, with roughly 600,000 Jews and 5 million Muslims. And after those four years living among the French, I concluded that the country’s nearly religious devotion to secularism is at least a partial explanation for the country’s latent racism and anti-Semitism. It also fosters an ignorance that likely contributed to the perverted mindset of the suspected Toulouse gunman. Mohammed Merah might have been a radical Islamist of Algerian background, but he’s also a French national who grew up in Toulouse. To understand French anti-Semitism, one must first understand the origins of its Jewish population: Jews have lived in France for over 2,000 years, with even some prominent Jewish religious commentators residing there in the early Middle Ages*; between the 18th and 20th centuries came the Jews of Central and Eastern Europe who were often fleeing pogroms; and the most recent wave, along with much of France’s Muslim immigrants, is of North African Jews from France’s old colonies, who largely began leaving as tensions rose in the Arab world after the creation of Israel and left en masse when enmity spiked around the 1967 Israeli-Arab War. France has a long history of anti-Semitism with two main, albeit separate, strains: the more modern one coming from descendants of recent Muslim immigrants, and some leftists, who identify very strongly with the Palestinians—Merah seems to fit this camp—while the other stems from a centuries-long, heavily Catholic-influenced tradition. One of the most well-known instances is surely the 1890s Dreyfus affair, when the French rioted over whether a Jewish army officer could truly be considered French. The vitriolic reaction so marked one Austrian reporter that he decided Europeans would never accept their Jews. He left Paris convinced that sooner or later, Jews were going to need a place of refuge—a fairly perceptive observation, in hindsight. That journalist was Theodor Herzl, the founder of the modern political Zionist movement that eventually led to the creation of Israel in 1948. U.S. media noted this week that the Jewish school shooting in Toulouse was the worst violent anti-Semitic attack in France “in decades.” They were referring to the 1980 rue Copernic synagogue bombing, which rose to further infamy after then Prime Minister Raymond Barre characterized the attack as “a heinous act against Jews in a synagogue that struck four innocent Frenchmen crossing the street”—again reinforcing the idea that one couldn’t be French and Jewish. The claim that Monday’s shooting was the worst violent attack in “decades” is somewhat misleading, since it glances over the fact that there have been scores of violent anti-Semitic acts in recent years—yes, perhaps not reported by the international press, but certainly on par in horridness. How could the media largely forget when Ilan Halimi, a Jewish 23-year-old of Moroccan origin, was brutally tortured in 2006 for weeks on end before his body, burned in acid and gasoline, was found in a woodlot outside Paris, all because his kidnappers thought his family could afford a ransom? (The kidnappers had presumed that he could quickly access funds because he was Jewish, ignoring that Halimi was from a working-class family.) It always struck me as a bit off that the French largely viewed that case as one perpetrated by Muslim immigrants: The ringleader of the gang grew up in Paris, and if that doesn’t make one French, what does? Or what of when an entire Jewish school was burned down in a middle-class Paris suburb in 2003? And what about the hundreds of anti-Semitic acts that are recorded each year? True, the number of anti-Semitic acts in France has decreased recently—there were 466 in 2010 and 389 last year—but the number of violent attacks have increased over the same time. That is why I wasn’t all that shocked by Monday’s shootings. When I lived there, France seemed like a powder keg of stubborn intolerance. If that is true nearly 70 years after the Holocaust, there was no reason to think it would be much better any time soon. And as bizarre as this may seem, my heart sank when I learned that the besieged gunman was not a neo-Nazi, one early popular theory, but a radical Muslim. I actually would have preferred him to be a neo-Nazi. For now, I predict that in an ironic twist of fate, what was explicitly an anti-Semitic attack will become a source of anti-Semitic and hypocritical finger-pointing, as French presidential candidates will use Merah’s background to supplement their borderline racist rhetoric on the importance of laïcité and integration, while those who wish to downplay the very horror of an attack carried out by a French citizen will point at Israel, which the gunman named as a reason for targeting Jewish children. But if you say as much, people will only glower at you and stare.